Clarets boss Sean Dyche accepts a two-week break has come at the right time for his squad. 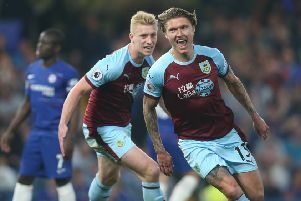 And he is hopeful of having record signing Chris Wood and centre back James Tarkowski back for the next game, at home to Southampton on Saturday, February 24th. Burnley are on a run of 10 Premier League games without a win, since going fourth for 24 hours after beating Stoke City 1-0 at Turf Moor. They have taken five points from a possible 30, but, remarkably, are still seventh in the table with only the recognised ‘Big Six’ above them. That sequence of results has coincided with the squad being severely stretched by a spate of injuries. Skipper Tom Heaton has been out since September with a dislocated shoulder, Robbie Brady and Steven Defour have both been ruled out for the season with knee problems, and Wood has missed the last eight games with a niggling medial knee ligament injury. Stephen Ward returned to the bench for the 1-0 defeat at Swansea City on Saturday after nine games out with a knee problem, but Phil Bardsley was ruled out with a hamstring issue, and Tarkowski, who has missed six of the last 10 games through suspension and injury, was again out with a groin injury. Jon Walters is also out after minor knee surgery, and Dean Marney has suffered a setback after his long-awaited return from a long-term knee injury. Dyche had Aiden O’Neill on the bench for the first time this season after spending the first part of the campaign on loan at Fleetwood Town, before going away with Australia for the AFC U 23 Championship in China. And young prospects Ollie Younger and Dwight McNeil were also part of the travelling party to South Wales. Dyche feels the fortnight’s grace, due to the Emirates FA Cup fifth round, will be of benefit: “We’re hopeful (of getting bodies back over the break). “A couple of weeks have come at the right time. “I think the players need a break from it. “The players coming back fit we’re hopeful with. “Wardy as you saw, is back but only just trained last week so he’ll have another couple of weeks under his belt. “And we’re confident with Woody and Tarky, Dean Marney, and they just add that layer to the squad. “Once the group are back together again, they all look around and say ‘alright, this is us getting back to where we are as a collective’, and I think that’s important when you have such a tight knit group. “We’ve had two of the kids with us just in case, and that’s as stretched as it’s ever been since I’ve been at the club, but that’s no excuse.